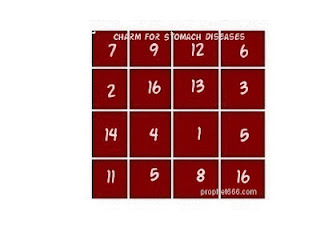 This is a charm to cure chronic and recurring stomach problems. Chronic stomach ailment can trigger of an unlimited number of severe ailments; including skin problem, ulcers and even cancer. Thus keeping the stomach clean and healthy is always advisable and should be a priority. This Yantra needs to be written on a Bhojpatra with the paste of Ashtagandha and worn around the neck or kept on the body of the patient. This Yantra has to be inserted in a copper amulet. It can also be embossed on copper to make it long lasting and permanent in nature. 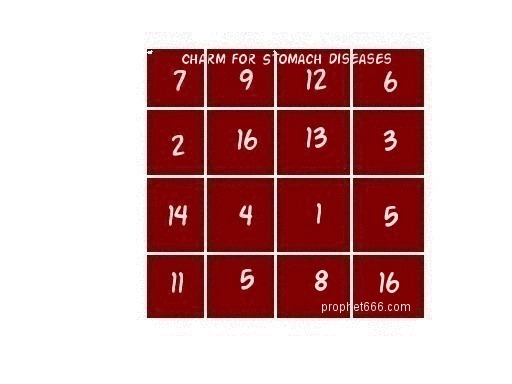 You can replace the copper amulet, by folding and stitching the Yantra inside a Cloth Tabeez of Yellow colored cloth. Yes, you can do so because it is for the same planet.